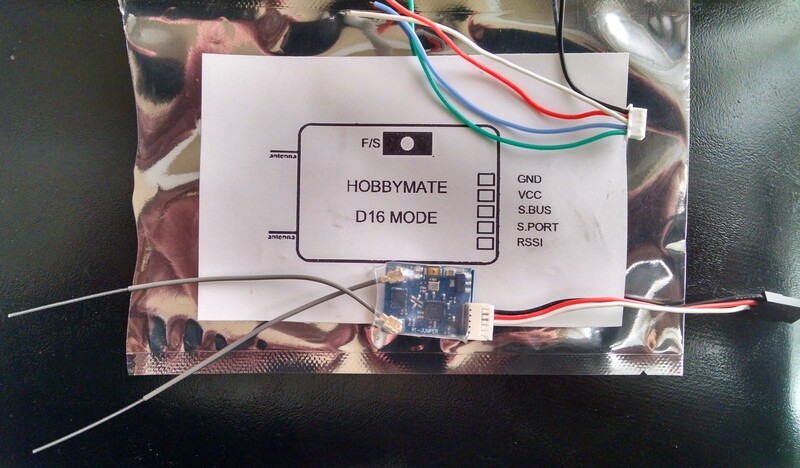 Documenting and testing the Hobbymate FrSky compatible RX. I've had very good experiences with other Hobbymate products, starting with some 2204 motors that I bought a few years ago and continue to use frequently. As you can see above, this came with 2 output plugs ... one that can be used for simple SBus output to something like a simple gyro like the A3Super2 I will first use for range testing AND another that will allow me to wire it to a quad's flight controller. This video is just a quick intro of the Jumper T12. My hope is this blog entry will become both a useful introduction and a resource for people who buy the T12. Please post questions or requests on the RCGroups T12 thread linked below. Note: Banggood provides a product sample and lets reviewers post their own findings and opinions – this is a good thing for all of us. They provide an ID for each reviewer, so they can track which reviews people are motivated to check their website . When you find a review helpful, please consider voting your thanks to Banggood with a click to their website. I’m not going to get a fee for that. Your cost is the same if you decide to buy. The T12 is a radio control transmitter designed as 2 parts - a system. The first large part is a controller that runs a lightly modified version of OpenTX firmware inside a small case that has the usual sticks and switches/pots, plus a bay like one formerly offered with JR brand radios (and a few other radios still available today). Control commands are sent by wire/pins to an external radio frequency (RF) module only when it is plugged into the bay. My son has finally gotten a little interested in RC. I was planning to give him my DX6i but realized that my old Flysky T6 has a few more programming features and would be a better platform if only we could add modules to it. 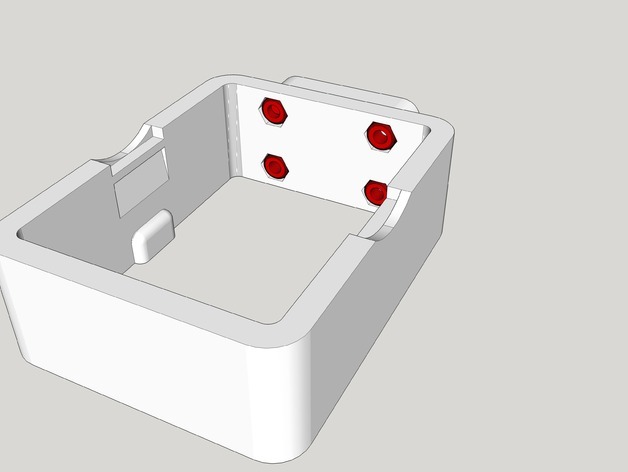 Since he has a 3D printer I got him to print a case with a module bay/box that can be attached to the transmitter carry handle. Next I found a diagram for the trainer output showing me that I should be able to get PPM off the back of the T6 transmitter. My son had an old S-VHS cord to use for plugging into the trainer port. Bay will accept standard JR modules, with a cable from the module to the trainer port. Only 1 plug and a short lead is used, not a complete trainer cable. Header pins added in top left corner for firmware updates. Lower right corner shows the connection labels. The inexpensive FD802 SBus/PPM RX for FrSky will transmit two voltages via telemetry and display them on my Taranis X7. This voltage sensor lead is available, but I may also try to build some leads to read 1S, 2S, 3S, and 4S flight pack voltages. Note that these are not for a smart port - presumably analog. Basically the idea is to drop voltage into a 1S level and then calibrate it so that it reports the voltage for whichever multiplier is needed to get back to a multi-cell battery level. See the manual for the sensor above which shows how it uses multipliers/dividers to get voltage into range. Below are notes to help. Tobey from Banggood invited me to try the Sunrise Sword 60A Brushless Speed Control. In summary, this is a heavy duty controller that appears to be deluxe and up to the task. It is a product designed for helicopter and airplane models, but it is set up for heli use with the slow heli start up. I had no problems using it in default settings, but I would order the program card for it in case you want to modify any parameters. After adding 3.5mm bullet connectors and a battery connector, weight was up to 70g. My digital multi-meter showed both the standard 3 wire and the split connector (see pictures) power leads for the receiver at 5v. The ESC runs off a 32-bit ARM processor designed to give high resolution for a smooth and responsive throttle. Failsafe from throttle signal loss after turning the TX off took <2 seconds to kick in and power returned to the TX setting almost instantly when the TX was turned back on (using the pictured Lemon stabilizer). The ESC has regenerative braking, saving power compared with the other regular ESCs. It offers adaptive timing, so as to be more easily compatible with many motors. The ESC automatically detected a regular throttle input signal from my Spektrum TX/RX. ESC calibration was normal, starting with high throttle and then moving to low throttle after 1st use. Note: A programming card is used for implementing different settings. I do not yet have the Sword Programming Card, but there are many settings shown in the manual that might be useful, particularly for heli use. - Regular signal throttle range is 900us-2400us. - Special designed governor mode and soft start up mode for Helicopters. - Adaptive timing. Or manually set timing, 6 options available. - Adjustable brake by proportion, 3 options available. ESC with connectors added for battery and motor. Note the 2nd BEC lead with split power and signal connectors. Tested with receiver and 2826 2300kv motor. Note the extra cap provided is shown connected to the receiver. This DIY converter takes brushed motor output as input to a brushless ESC. The brushless ESC uses modified BLHeli firmware to interpret the signal coming off of the Delta Ray receiver. Previously I posted a brushless conversion of a DR receiver with burnt mosfets (motor runs without throttle input). Rather than replace the mosfets, signal was taken from the input to the mosfets' original location. Also posted was a build summary of a new brushless DR build using that receiver. However, the goal of this build is to go brushless WITHOUT modifying the original DR receiver. Imboeschi published a voltage divider schematic with his modified firmware as one of several ways one may convert the signal for use with brushless ESC and motors. My concept is to make this circuit with connectors so that it is plug and play to the Delta Ray receiver. The RX is not modified and can be returned to stock if one wants to do so later - (why?) 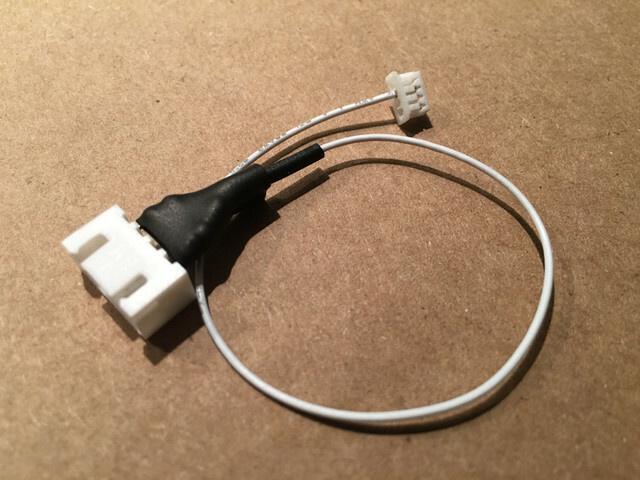 - this would allow for removing the receiver at a later time and replace or use it for a scratch build, or to keep the motors and ESCs and sell the original plane. Above, the parts are laid out roughly as they will be soldered. My first brushless Delta Ray is being built from parts - mostly from Horizon Hobby, including an OEM Delta Ray receiver modified to connect to external ESCs and run on 3S. The ESCs now run DR Edition BLHeli firmware instead of their original Simon K firmware. With a Delta Ray to use for a similar project the cost would be just the motor/ESC and a few misc items if modifying your own receiver. A collection of motors and mounts, before I start building my own brushless Delta Ray. Click on the picture to go to the post. Not having seen many long or active threads about using a CC3D flight controller with Open Pilot firmware for fixed wing really slowed down my search. It was on the radar very early, but I've tried a variety of other gyros due to the lack of good fixed wing info about the package. Late last year two threads encouraged me to give it a try for a couple of my planes, including the Delta Ray. Below are some pictures of the FC mounted to replace the DR RX. DSMX-compatible remote receiver is used as the primary receiver. This version of the CC3D flight controller is called the EVO and it has 2 ports for directly connecting 2 remote receivers with the correct 3V power connection built in. UBEC also shown. Cased controller mounted on 2 plastic cards screwed in place where the original brick was mounted. The RX was mounted inside the fuselage forward of the CC3D. A small bit of foam was removed to allow a USB mini cord connection for programming changes. It does not need to remain in the plane for flight. Caution: the Pro 180 motor can create more heat than the standard DR ESC can handle when flying at part throttle. After conducting prop tests on the bench, I've decided to try to improve the installation and avoid burning out my DR oem receiver. The approach is to use external brushed ESCs with either a modified DR receiver, or a CC3D flight controller using a DSMX-compatible remote receiver as the primary receiver. 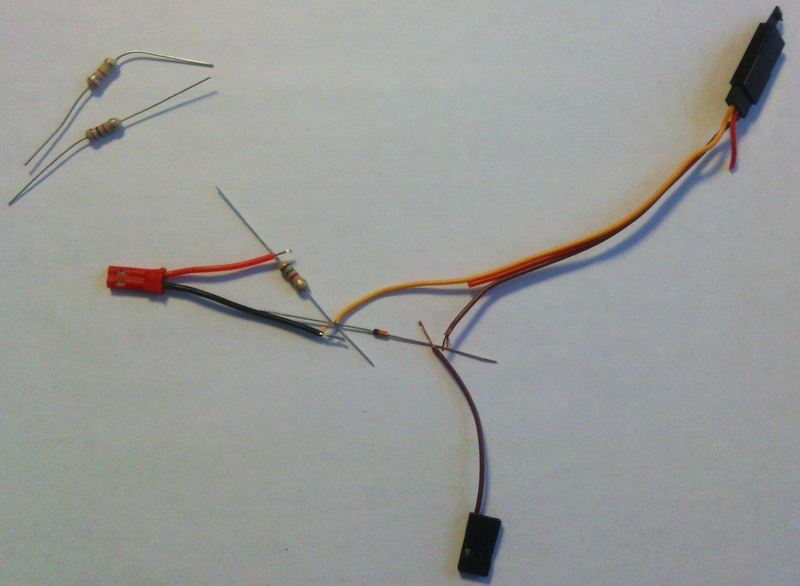 The wiring shown in the modified receiver link was designed for both alternatives (and brushless ESCs/motors) and was ultimately used with the CC3D and remote receiver. A traditional receiver could also be used. Note: Space between the front nacelle mounting posts is ~21-22mm by ruler (calipers are MIA). Without nacelle modification or replacement, this limits motor replacement alternatives to relatively small motors unless the bell is mounted ahead of, or behind, the posts. Step 1 - Take the bottom of the nacelle off of the plane to remove the oem motor. and wiring. Pull the prop straight off the front. Remove the screws shown. (The gear can stay on if you wish.) There are also 2 screws holding the front of the motor. Push the motor back and lift out. Has anyone else ever wished they could connect traditional motor speed controls (ESCs) directly to the Delta Ray receiver? My regular flying buddy has completed several Delta Ray projects, with and without the stock Delta Ray receiver. We've both dreamed of being able to connect regular ESCs to the receiver in order to keep all of the other nice features that we have enjoyed since we bought our Delta Rays. The images below are of a once stock receiver board - resurrected from its untimely death- modified to allow connecting traditional speed controls (ESCs). - And many other Delta Ray thread participants for their ideas and encouragement. The throttle signals have a nice linear flow from 0 to full throttle. Motor tests will next help determine if ESCs will use this 3V signal to run the motors normally, or if a signal amplifier might be needed, or if a unique ESC solution will be needed. See the next post below for motor tests using brushed and brushless ESCs, using 2 different motors for each ESC. Xtreme Productions Pro180 motor test, using Delta Ray and some larger props. Includes HobbyZone Delta Ray 180 motor/prop baseline comparison. Static tests completed using a HobbyWing brushed ESC instead of the Delta Ray SAFE receiver with 2 integrated ESCs. The Delta Ray motors are very well suited to a beginner. Once the beginner has learned to control the Delta Ray they may feel ready to increase power. The Pro180s are a nearly direct swap for the original equipment manufacturer motors, the increased power draw burnt out a mosfet for one of my flying buddies who made the motor change. Since I am not aware of the power limits to the SAFE brick, I've decided to use an external ESC for testing. For this reason, I cannot recommend any motor or prop change to the oem Delta Ray equipment, but I wanted to collect and provide some data that the community may use at their own risk. I was also unable to acquire any current draw or prop testing information from Xtreme or the many dealers listed as carrying their product. However, the company graciously provided motors for testing, without any test requirements. RCG friends graciously supplied Hobby Zone motors/propellers and the meters used in these tests. A selection of props,and 2mm prop savers were purchased for this test. This will be a log of the steps I use to prepare and flash an ESC with BLHeli firmware. - First candidates are a couple SuperSimple 8-10A ESCs that were given to me. Unfortunately, these do not appear to be supported. - Next candidate was an EFlite 30A ESC that also does not appear to be supported. Looks like I will need to budget and buy an ESC after looking through the supported ESC list. My first two purchased planes were a Delta Ray and a Sport Cub S; both of which have brushed motors. Because the SCS replacement motors have a reported trend of being very inconsistent as to lifespan I want to start planning for a conversion to brushless. The DR motors may last longer but eventually they will also lose thrust and wear out. Ideally, I'd like to skip using a PWM to PPM converter and use an ESC that will take a PWM input to run the brushless motor. BLHeli is an ESC firmware that has PWM input as an option. I'm also wondering if SimonK or other firmwares might be alternatives. NOTE: Brushless Delta Ray project using modified stock brick is completed. On the Delta Ray I would like to go to an ESC and motor that can handle 3S or 2S power with out blowing out the 2S brick. I am hoping a separate 2S receiver battery for RX and servos and PWM output might work if I wire 3S power for the motors and their external ESCs separately. Alternately, in the resource link it was found the brick can be upgraded to 3S with a capacitor change but that is likely to be too much for small brushed motors. The correct PWM signal output point appears to be the gate pin on the power mosfet. For the Delta Ray the Gate on each motor FET is pin 4 and output from the MCU coming to the gate is 3v (so a high end ESC or signal amplifier may be needed to handle the low voltage).